Gaze out the window of your state-of-the-art helicopter for spectacular aerial views of San Francisco Bay, the Golden Gate Bridge, Alcatraz and vineyards on an unparalleled wine country trip. Land near one of Napa or Sonoma region's best wineries for a guided tour, tastings and pairings. As you roam past gnarled vines, learn about the grapes that make a world-class wines. When it's time to go, enjoy your helicopter flight back to San Francisco. In Northern California, few experiences are more luxurious than a wine-tasting trip to Wine Country. The world-class destination boasts sprawling vineyards, boutiques, Michelin-star restaurants, and scenic landscapes. For an unforgettable taste of wine country, take this round-trip narrated helicopter flight to visit to one of region's finest vineyards. Start this tour with morning pickup from your selected San Francisco location for a short ride over the Golden Gate Bridge to the charming town of Sausalito. 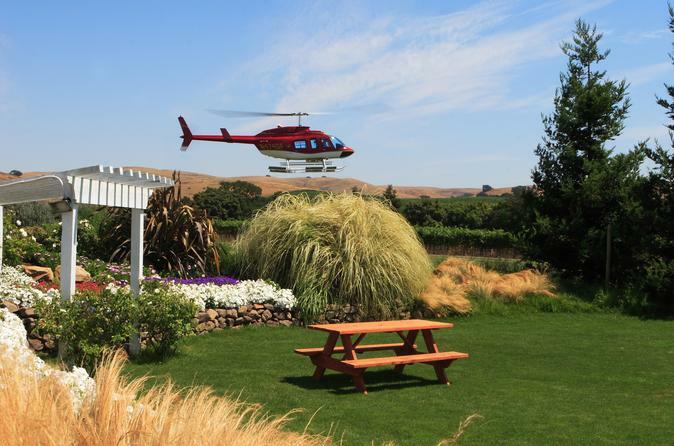 Board your helicopter, limited to six passengers, to fly north over the San Francisco Bay toward wine country. Indulge yourself with a guided wine tasting and food pairings. Our wine educators will lead you in the essentials of creating as well as enjoying pairings. After your hosted visit, you don't have to worry about traveling long. You will return back to San Francisco flying over pastoral landscapes and and our complimentary shuttle will return you back to Nob Hill, Union Square, or Fisherman's Wharf, where the experience concludes. Please note: Depending on availability, your winery visit will be held either in Napa or Sonoma.